Iran has announced the cargo ship intends to deliver its shipment directly to Yemen and ignore UN demands that all relief shipments for Yemen first be delivered to a UN inspection station in nearby Djibouti. Last week, the deputy chief of Iranian armed forces, Gen. Massoud Jazayeri, said any attack on the ship would spark a regional war. U.S. official said the Iranian ship may in fact be carrying relief supplies and not weapons. But allowing the ship free passage into Yemen without an inspection could set a “dangerous precedent” for future shipments. Pentagon officials said no final decision has been made on the U.S. response, NBC reported. 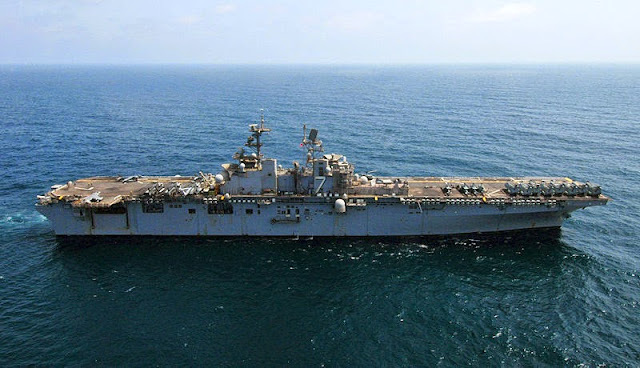 Pentagon identified the warship monitoring the movements of the Iranian cargo vessel as USS Iwo Jima (LHD-7), a Wasp-class amphibious assault ship. it's best to avoid any trouble and have the Iranian supply ship accidently become disabled at sea rather than anything else. of course, the ship might have to be seized because the shipping company has some debts somewhere.